Outside of technology, two of the most significant innovations to hit the office in the last half-century might have been the Post-It Note and the dry erase marker board. This is evident in the way both have endured through, and integrated with, the wave of technology in the modern office. For all of the e-mail, instant messaging, and remote conferencing that happens, every desk still has a stack of Post-Its and every conference room either has a whiteboard or seriously needs one. Truth is, whiteboards are useful anywhere. Thanks to Post-It's new Dry Erase Surface, now they can actually be anywhere. On one side is a removable adhesive that can be applied to many surfaces. On the other is a quality dry erase surface that resists ghosting better than a standard melamine board. 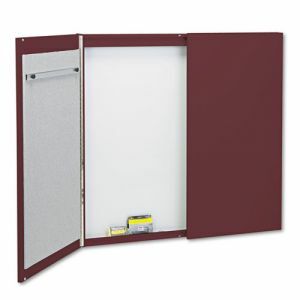 This allows companies to put the sheet anywhere they want, horizontally or vertically. A wall can become a whiteboard, a table can become a whiteboard... an old chalkboard can become a new whiteboard! Since the sheets can be cut to any size, the applications here are endless. Factories and warehouses can use them anywhere for communication and direction. Conference rooms can be outfitted with new dry erase surfaces or have their old ones repurposed. The most exciting prospect is collaborative flexibility. Collaboration happens everywhere at the office; minds do not always meet in meeting rooms. Whether at a desk, a set of cubicles or just the hallway, two or more people can start hammering out ideas anywhere. Having more whiteboard space available in such locations allows employees to write their ideas down, work off each other and come up with solutions and breakthroughs more easily. Take a look at the linked videos and see how the Post-It Surface can help your company.